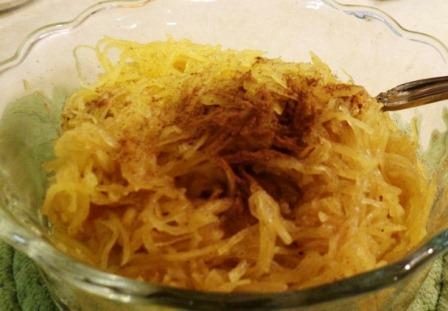 From Minnie: We finally decided to try a spaghetti squash dessert…and we absolutely LOVED it! 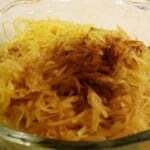 We really like spaghetti squash with a spaghetti sauce served over it…and hubby really likes spaghetti squash served with a bit of olive oil, garlic, and herbs…but we had never tried it sweetened until this week—yummy, yummy—it is soooo good! Slice squash lengthwise and place cut sides down on a microwave-safe plate or dish. Microwave at high for about 5-6 minutes or until softened enough to rake out strands. I used a small squash so it may take a bit longer if your squash is larger. Cooking the squash can be done ahead of time. Once it’s cooked, scoop out the squash (I only used half the squash, since we only needed 3 servings---but this recipe is easily doubled to serve 6). In a pan, heat olive oil over medium heat. Saute the squash with the sugar, ginger, and spices, adjusting them to suite your taste. Saute until thoroughly heated throughout.